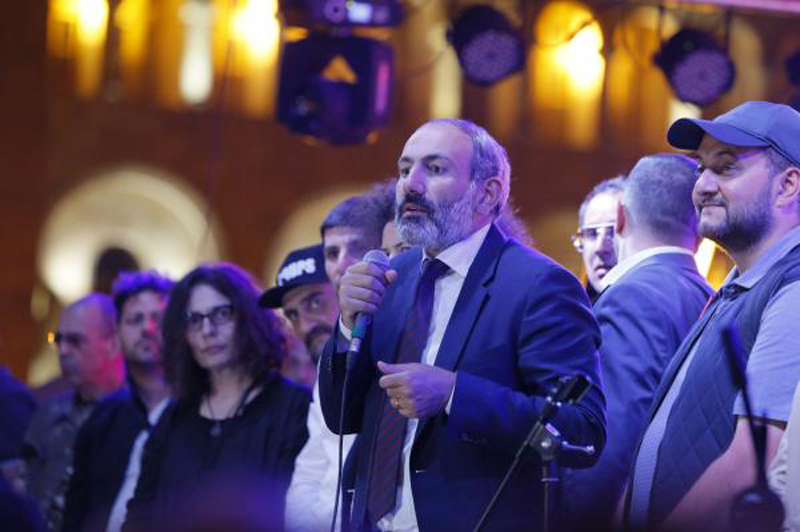 Armenian opposition leader Nikol Pashinyan called for a general strike Wednesday after falling short in his bid to be the country's next prime minister. Pashinyan was the only candidate up for consideration to replace former Prime Minister Serzh Sargsyan, who resigned in April. He needed 53 votes from the 105-seat Armenian National Assembly to secure the premiership, but received 45 votes. The Republican-led legislative body initially indicated it would support him, but some blocked his bid, saying he brought chaos to the streets. "Mr. Pashinyan, I don't see you at the post of prime minister, I don't see you at the post of commander-in-chief," said Eduard Sharmazanov, deputy speaker of parliament and Republican spokesman. Pashinyan said the National Assembly, which backed Sargsyan, now risked war with its own people. "The Armenia you knew and ruled is no longer," Pashinyan said. "You still have time to redeem yourselves ... but if not ... [you] will be will be the reason for the tsunami that will result on our country's streets." He urged his supporters to block streets, airports, the railway and other public transportation. He also called on police to join in the protests. "If everyone participates in a total act of civil disobedience, this will be a total victory of the people of Armenia," he said in a rally in Yerevan's Republic Square. "Our struggle is a struggle of non-violence, it is a peaceful act of civil disobedience." Sargsyan resigned April 23, six days after taking office as prime minister. He spent 10 years as president prior to that. Thousands of demonstrators in the capital accused Sargsyan of corruption and authoritarian rule -- and his resignation followed news that Pashinyan was freed by police after his one-day detention. Pashinyan, a parliament member and organizer of the protests, was taken by police to an unknown location during earlier demonstrations; two other opposition leaders and at least 200 protesters were detained by police. In a resignation statement, Sargsyan said, "Nikol Pashinyan was right. I was wrong. This situation requires solutions, but I won't participate in them. I leave the post of this country's prime minister. The movement on the streets is against my office. I will fulfill your claim." Armenia, a small country in the Caucasus region straddling Europe and Asia, is a former Soviet republic bounded by Turkey, Georgia, Azerbaijan and Iran.